In the wake of rising Islamophobia, terror attacks and wars in Muslim countries, the Presidency of Religious Affairs of Turkey has come to the fore to exert effective efforts for global Muslim solidarity. 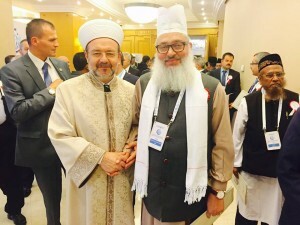 During the last few years, it has organized several events bringing together Muslim clerics from around the world including a summit of Eurasian Muslims, the African Countries Religious Leaders Summit, a convention of European Muslims, a meeting of clerics from Balkan countries and a summit of religious leaders in Latin American and Caribbean countries. In a continued effort to uphold its noble cause, it has been bringing together top Islamic scholars promoting unity among Muslims in the face of violence stemming from sectarian strife and other internal struggles in Muslim countries. 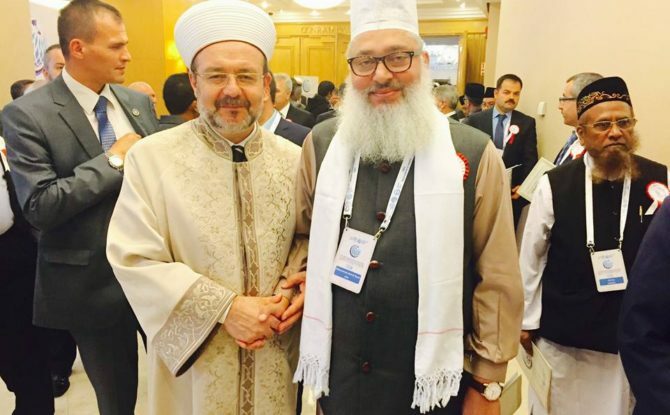 In its continued effort to reaffirm the global Muslim unity, the Presidency of Religious Affairs of Turkey (D?B) in association with Directorate General of Foreign Affairs and Department of Muslim Countries & Communities organised First Asia & Pacific Countries Muslim Religious Leaders’ Summit. This 4-day international event brought together Muslim clerics from Asian and Pacific countries in Istanbul. Aimed at establishing global unity among Muslims, this event started on October 12, 2015, and lasted today after Friday prayer (called “Cuma Prayer” in Turkish language) in Sultan Ahmed Mosque (Blue Mosque). Thus, the summit will go down in history as the latest bid by the state-run organisation to enhance universal brotherhood and fraternity of Muslims the world over. Besides, there were subsequent sessions for general presentation of representatives of different Muslim countries. Mehmet Görmez, the head of the D?B and chairman of the Peace and Moderation Permanent Contact Group in Turkey spoke at the very outset. He stated: “the summit was aimed to re-establish religious, historical and cultural ties between Muslim countries and communities in Asian and Pacific countries and Turkey”. He further said, “We are here to exchange knowledge with brothers we haven’t met for decades. The summit does not aim to impose any thoughts on Muslim communities or take problems from other parts of the Islamic world to those regions”. “This is a meeting to discuss cooperation opportunities after a long period of inaction. We are meeting to exchange experiences on providing religious services addressing our age’s needs”, said Mr. Görmez. Mr. Görmez also highlighted the “struggle within the Islamic world” and called on all Asia Pacific Muslims to help their Muslim brothers in the Middle East and Balkans. “All Muslims are equal. No one is superior to the other regardless of geography, language, ethnicity and wealth,” he said. He also warned that when people lose wisdom, peace disappears along with it as well. 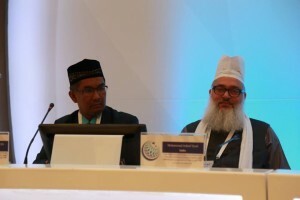 Among participants of this international Muslim religious summit were Muslim clerics, Imams, Sufi scholars and officials from several Asia Pacific countries, including Afghanistan, China, Indonesia, Malaysia, Sri Lanka, and Bangladesh. A number of eminent Islamic scholars from India and Pakistan also addressed the international Muslim gathering. He further said that “Islam in Asia-Pacific countries is a legacy of Sufi saints who disseminated their pluralistic messages at a time when the idea of religious tolerance was not even debated in a large part of Western Europe. They laid greater emphasis on the broader Qur’anic notion of wasatiyyah (moderation in life) maintaining a moderate narrative of Islam which exhorts man not to transgress the limits determined by God”, he said. Syed Mohammad Ashraf Kichauchawi also said that “at a time when the extremism has penetrate the Asia-pacific countries in different forms, Sufi Ulama, Mashaikh, Imams and muftis from Morocco to India to Bosnia to Chechnya to Pakistan to UAE to war-torn Syria –including Shia community, have come out to tackle the onslaught of religious extremism”. “So far, Sufi Islamic scholars and clerics and their organisations have held back the tide of extremism and radicalism”, he said. Syed Mohammad Ashraf strongly condemned all groups who are perpetrating terrorist acts in the name of Islam. “Terror is terror, it has no relation to any religion, and it is a grave threat to all humanity,” he said. He also condemned the last terror act in Turkey. “No matter which religion it comes from, we condemn such terror incidents, he said. He hoped that the summit would help rebuild deep cultural and historical relations and values between Muslim countries. During their speeches, Afghanistan Hajj Minister Feyz Mohammad Osmani and Indonesia’s Religious Affairs Minister Lukman Hakim Saifuddin offered their condolences to Ankara victims, who were killed in the twin bombings Saturday, which left at least 97 people dead. About the challenges facing Islamic countries today, Saifuddin highlighted the role that education could play in confronting the challenges, adding that through education “we will be able to find solutions to the crucial problems that the Islamic countries have faced in the last several decades”. Bangladeshi Minister for Religious Affairs Matior Rahman, head of Islamic Association of China Hilaluddin Chang Guangyang, Malaysia’s Religious Adviser to the Prime Minister Abdullah Bin Muhammad Zin, and Minister of Muslim Religious Affairs of Sri Lanka Mohamed Hashim Abdul Haleem also delivered speeches at the summit. Governor of Istanbul Vasip Sahin and Istanbul Mayor Kadir Topbas were also present at the summit. Turkish Deputy Prime Minister Numan Kurtulmus also spoke at the summit about the paramount significance of justice, freedom, and responsibility in Muslim countries. 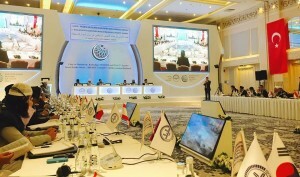 According to the Turkish officials and organisers, the event was solely aimed at recognising Muslims in Asian and Pacific countries, exchanging ideas on problems of the Islamic world and discussing solutions, re-establishing historical ties with Muslim countries and communities in the Asia-Pacific region and discussing opportunities for cooperation in religious education and services. The summit also dealt with the effects of new mindsets in the Muslim world on the Asia-Pacific Muslim communities, the future of the Muslim world and Islamophobia.